At 12pm yesterday, Wigan confirmed Dom Manfredi was returning and at 12.30pm, we learned the club had its two competition points reinstated. Not a bad, double-fire tonic to the hangover from their loss at London Broncos for the Warriors fans! In January, when Wigan were docked two competition points for breaking the cap in 2017, I said I didn’t think the punishment fit the crime. If what they had done was so incredibly bad, I argued, then why only a £2,500 fine in addition to two points? It’d be like being imposed three points for speeding, and being fined 74p. 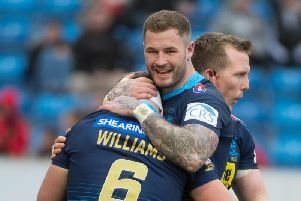 Twice before, Super League clubs have been docked two points, and in those instances the breaches were for more than £72,000 – more than four times Wigan’s latest breach. In fact, St Helens once broke the cap by the same percentage as Wigan have, weren’t deducted any points and were hit with an £18,000 fine. So was I surprised by the verdict of the independent appeals panel? No. Was I surprised by the reaction it sparked? This is Wigan, definitely not (though I did want to scream 'IT WAS AN INDEPENDENT HEARING' to those claiming the club had some sort of influence on the RFL). But it did raise an interesting discussion point in the office. In the original independent hearing, the RFL legal team said Wigan’s breach - of £14,000, less than one per cent, overlooked because of an admin error - wasn't 'minor', but 'serious'. Why? Because the legal team stated the club's previous two breaches were "relevant to consider”. But those sins were committed under the previous management of Maurice Lindsay (which, for what it's worth, weren't punished harshly enough in my view). But is it fair that those offences should dial up the severity of the punishment now, when Wigan are under the ownership of Ian Lenagan, who has no ‘previous’? Yes, some say. This is about Wigan, not about the custodian of the club. But to me, it seems a little harsh that Lenagan would face extra punishment for being a ‘repeat offender’ when, at the time, he was in charge of another Super League club and has never offended. And take that argument on, if it’s a club’s past which is considered in salary cap hearings – rather than the management’s – could an owner who had flagrantly broken the cap rules in the past take over a new club and start reoffending, with a clean slate? Sport Resolution published its judgement in full when it heard Salford's salary cap appeal. I've asked whether it will be doing the same this time - it'd be interesting to see how its experts weighed up the club's 'previous'. I'll keep you posted.